May 1984 Stay at Siemens Central Research Laboratory for working　to transfer Super Conducting Lens technology. May 1989 Development of Ultra-high Vacuum Variable Temperature STM. 2002 Director and General Manager of Semiconductor Equipment Division. To accommodate needs for atomic-level surface observation under variable temperatures with the scanning tunneling microscope (STM), Masashi Iwatsuki developed the world's first ultra-high-vacuum, temperature-variable STM, completing it so that it could be marketed; he has also released numerous results of observing various phenomena, beginning with phase change on crystal surfaces. This application for the Yamazaki Prize focuses on that entire series of results. Mr. Iwatsuki strove to develop STM element technology to enable observation of stable atomic images while dynamically altering specimen temperature from ultra-low to high temperatures. The element technology he developed includes the following: a drift-free structure so that thermal diffusion on the stage forms concentric circles emanating from the center of the specimen; a hard, small and light high-speed scanner, which serves as the driver that is the heart of the STM; a system for controlling heat released from specimen miniaturization; and an independent exhaust mechanism with 3-chamber structure to maintain surface cleanliness. Mr. Iwatsuki incorporated all of this technology in the STM that he completed. Ultimate vacuum of under 2×10-9Pa was achieved in the main chamber. Even under extremely low temperatures of 30K or heating to over 800℃, specimen drift was curbed to under 0.01nm/s, which is nearly the same as at normal temperatures. No other device exists that enables direct observation of the atomic level at such a wide range of temperatures. By FY2002, 470 of the microscopes, including the ultra-high-vacuum and high-vacuum types, had been delivered to research institutions around the world. In addition, while developing the device, Mr. Iwatsuki reported numerous cases of application, with joint researchers. Although research on silicon's surface structure has been done with such methods as the conventional Reflection High-Energy Electron Diffraction（RHEED）and Low-Energy Electron Diffraction (LEED), observation has been limited to regular surface structure. Using the temperature-variable STM, Mr. Iwatsuki observed surface images of Si (111). Although oscillation or oscillating images of 1×1 structure and images of 7x7-rearranged structure were mixed together at 860℃, Mr. Iwatsuki discovered that at 840℃, there was a complete change to the 7x7-rearranged structure only; he thus clarified where crystal growth began and ended. In addition, Mr. Iwatsuki invented an ultra-micro-pyramid by layering silicon atoms to a height of 36 atoms and is making it possible to write text on silicon crystals in fine lines 2nm wide. These research results have received excellent evaluations not only for elucidating atom behavior but for accelerating the development of nanotechnology. Patents for the piezoelectric scanner, which is a core element technology, the STM control system and the like will cite Mr. Iwatsuki as the sole inventor. Under Mr. Iwatsuki's initiative, an entire chain of research has been advanced, including application research. 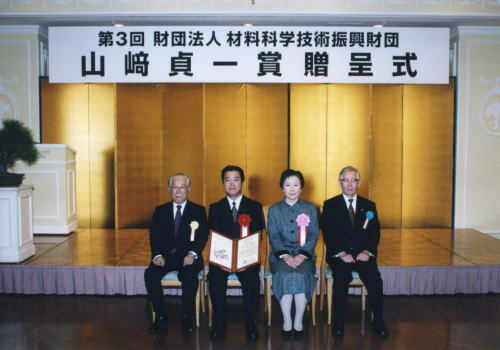 The content of his research fulfills the requirements for the Teiichi Yamazaki Prize in the field of measurement and evaluation, and matches the appeal for "contributions to the development and practical application of measuring instruments and technology with results that can be expected to achieve future developments." Mr. Iwatsuki's achievements are appropriate for the awarding of the prize, and I thus recommend him as a candidate this year.